The maternal uncle of Maharaj’s father, Shri Madhavrao was an ardent devotee of Shri Balmukund Swami. Once Shri Balmukund Swami happened to visit Shri Madahvrao’s house to enquire as to why Madhavraoji was not visiting the Mutt at Kandewadi, Mumbai. The visit of Shri Balmukund Swami was a complete surprise to Madhavraoji. He explained the grave situation within his family, in particular the ailment of Rajaramji (father of Shri Ram Maruti Maharaj). From childhood, Shri Maharaj was deep into bhakti marg, and used to sit in a meditation pose even during school hours. When the pundits used to read kirtans and shlokas, Maharaj asked several queries for which the pundits had no answer. During his childhood he used to put his legs inside a sack and kept his forehead on a Shivaling to perform meditation. Once during his meditation, Maharaj heard a distant voice asking him to come to Shri Balmukund Swami at Mumbai. When Maharaj heard that Madhavraoji was visiting Balmukund Swami, he insisted on taking him along with Madhavraoji. Swami took Shri Maharaj on his lap, and then onwards Maharaj regularly started visiting the Mutt and sometimes also stayed at the mutt. During his visits, Shri Maharaj was bestowed by his Master the Rama Nama mantra. Shri Ram Maruti Maharaj was initiated by Sadguru Shri Balmukund Swami from the Himalayas and also learned Hatha yoga from his 350 year old Guru. Maharaj was taken to many saints by his Guru for their blessings in Himalayas many of whom where meditating inside caves for years. 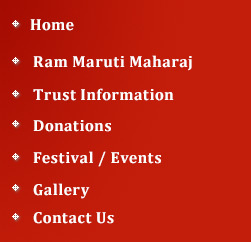 Shri Guru Balmukund Swami took Ram Maruti Maharaj to different places in their “Sookshma Roop” (subtle form). They both traveled in their celestial body to distant holy places and shrines in Nepal, China, and Japan. After approximately 12 years of pilgrimage, Shri Balmukund Swami brought Ram Maruti Maharaj to Mumbai in Maharashtra. After Shri Balmukund Swami’s final abode at Haripur (Sangli), Maharaj with other devotees started their journey to Shri Narsoba wadi near Kolhapur to offer “Guru Charitra Parayan”. After success of Guru Parayan and receiving grace from Guru Dattatreya, Maharaj left alone for the Himalayas for 12 years. Upon his return, Maharaj took a dip at the Holy Ganges in Kashi and stayed at Guru Bandhu’s ashram. During his stay at the ashram, there were several topics discussed on Veda Shastra, and at times Maharaj corrected their understanding on certain topics which were accepted by others, but at times, Guru Bandhu disliked Maharaj’s intervention. Shri Maharaj told Guru bandhu that he was sacrificing his language and Maharaj developed a new language consisting of 22 names of God. He named it as Ishwar nama bhasha and continued till his final abode. Whenever Maharaj saw a poor person, he immediately used to remove his clothes and give it to them. He distributed food the same way to the deprived and deserving people. He often used to jump high in a sitting posture and make a typical noise while in meditation and by seeing this people started calling Maharaj as an avatar of “Lord Hanuman”. An interesting episode took place in Shri Balmukund Swamiji’s Ashram when a group of devotees started their usual Bhajan. At the same time, one of swami’s disciples at “Shri Kshethra Kashi” was taking a dip in the Ganges by chanting the name of Shri Balmukund Swamiji and he suddenly started drowning in the Ganges. By seeing this incident, through Swami’s spiritual eye (divya drushti), Swamiji suddenly looked at Shri Ram Maruti Maharaj and conveyed the then happening incident in the river Ganges and his intent and mission to save the disciple. Through his subtle form Maharaj traveled to Kashi and rescued him. At the Ashram, all the devotees where shocked seeing Maharaj in fully wet clothes. Shri Balmukund Swami smiled and told everybody at the ashram that Maharaj had been to Kashi. Later on, Shri Balmukund Swami received a letter from the same disciple at Kashi informing him that Shri Ram Maruti Maharaj saved his life. Thus people came to know why Maharaj was wet during the Bhajan. At times, Maharaj’s face, resembled like Lord Hanuman. Maharaj always chanted “Ram naam” and sometimes used to jump high like Lord Hanuman. During meditation in Lotus posture (Padmasana), Maharaj used to literally lift his body two feet high from the floor. Shri Ram Maruti Maharaj held the fruits offered to him like Lord Hanuman. 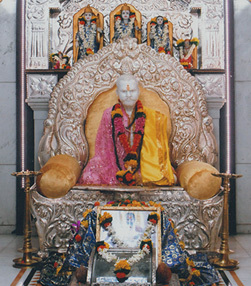 Shri Sant Ram Maruti Maharaj took “Samadhi” in 1918 (Bhadrapad-Krishna Navami at 5.15 am) (in Mahalaya). After 3 years, in the year 1921 a trust was formed. There is an interesting anecdote related to the construction of the temple. Once, one of the closest disciples of Maharaj Sri Sadguru Shantaram bhau Jaivant ji’s (from Bhivandi) disciple Shri Kalidas visited the Samadhi of Maharaj for darshan. He found that the Samadhi was uncovered and he took his umbrella and covered the Samadhi and declared that he will not move unless the Samadhi is covered. By noticing this incident, the devotees from Kongaon-Kalyan (Kumbhar Samaj), Sri Jetaraja, Jiva Narayan ji and others initiated the construction of a temporary shade. Later on in 1925, the civil work was started for the construction ofthe Mandir. It was renovated later in the year 1970 under the direction of Sant Shri Gajanan Maharaj Pattekar of Thane. Later on it was the desire of the devotees to have a marble statue of Maharaj in the Mandir and the same was installed on 19th April, 2009 with 3 days of celebration. Once in a year, the Mandir-Sanstha conducts blood donation and free medical camp for distribution of medicines for the benefit of the poor. The Mandir-Sanstha also provides text books and note books for SSC Students free of cost to children from economically backward families.